The other day I was reading Sharon’s post on Family Statistics. 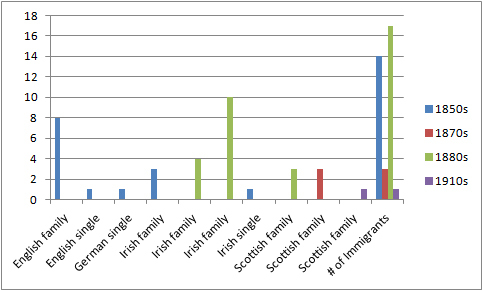 I’ve done statistics on groups of emigrants from Bavaria or Ireland but not my own family’s migration history. I’ve also “mapped” my ancestral places of origin but now how or when they came to Australia. Having realised this omission, and considering my first arrivals to Australia for the 2013 Australia Day Challenge, it was inevitable that I’d have to have a play. Unlike Sharon there was no point in considering where my ancestors arrived – they are all “true maroon” Queenslanders. I immediately knew that many had arrived in the 1850s but that each side of my family tree had one line that was more recent: one maternal Irish, in the 1880s, and one paternal Scottish in the 1910s, with a middle-range Scottish 1870s. 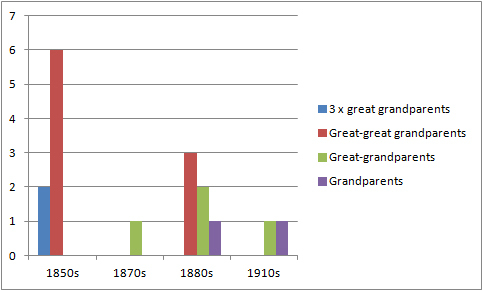 In this graph I plotted all family members who arrived in the migration event whether they were a direct ancestor or not. Because several migration “events” included multiple generations, I wanted to map my ancestors’ arrival by their ancestral relationship to me. For this purpose I ignored siblings, unrelated spouses, nieces and nephews etc.I also counted each ancestor separately eg my great grandmother and my great grandfather. I was somewhat surprised to realise that my earliest Australian immigrants included my 3 x great grandparents (it’s easy to sometimes lose track of the generations I find). The question whether they emigrated as singles, couples or families was quickly enough answered in my head, but how would it look on a table and then a graph? 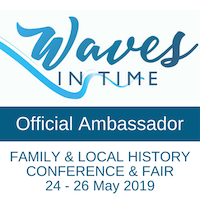 It was clear that, like Sharon, couples with no children hadn’t featured in my family’s migrations, nor do I have any ancestors who arrived as convicts. There were a few hardy singles in the 1850s, and 7 family exoduses en masse from their homelands, sometimes including all the family and some only a couple with a small child or grandchild. My 1880s migration was slightly distorted because two of the migration events were for the same family: in the second case, my great-grandparents left a year after the rest of the family due to the birth of their small child. 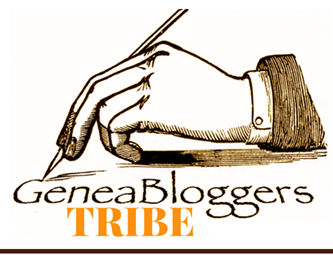 I found this exercise fun and informative – thanks Sharon for prompting me to look at this a new way. For a bit of light relief I thought I’d bake a birth pie for my great-great grandparents and their place of origin. This involves a little creative licence as I still have no information on the county of origin of my Sherry ancestor or anything really for my Callaghan g-g-grandparents but I think I’m fairly confident that they were born in Ireland. So here’s my slices of heritage pie. Sorry I didn’t quite get the colour right for my Queensland marriages -it should be maroon! 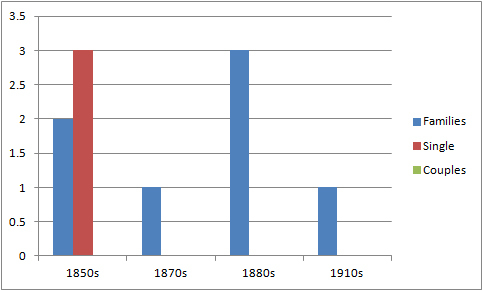 The residual deaths overseas reflects the fact that two branches of my famillies were late arrivals (1883 and 1910). 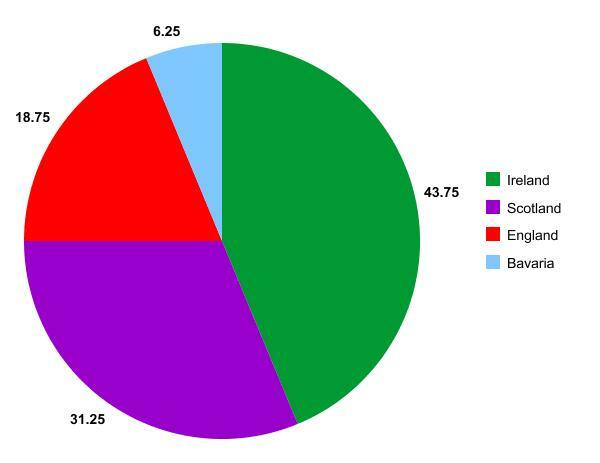 No wonder I identify so readily with the Irish and the Scots. 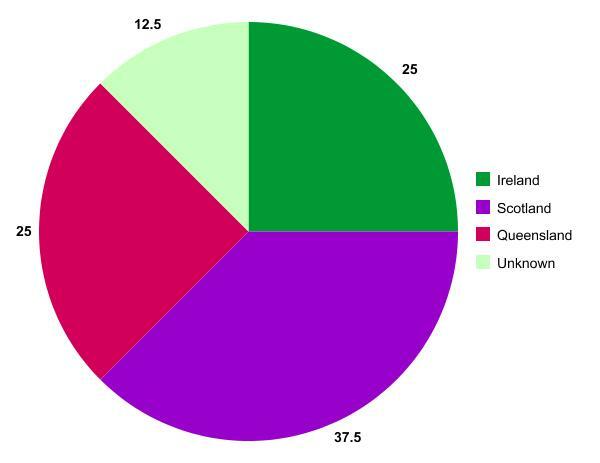 The Heritage Pie of Deaths: the unknowns probably include two Irish but the third, my James McSharry could be anywhere. 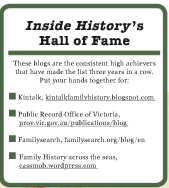 The swathe of Queensland deaths shows how embedded my families were in Queensland history. 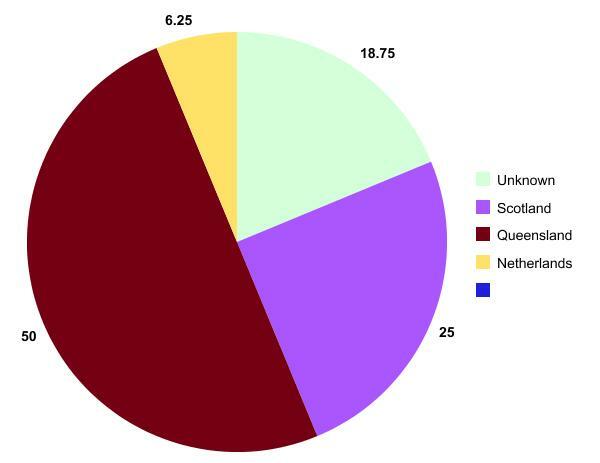 The Netherlands death is that of an ancestor who was a seaman and died on a voyage. The Heritage Pie of Ancestral Marriages: the pale green was probably Irish but is not certain. The reddish colour here should be maroon for Queensland! Places of birth for my great-greats.